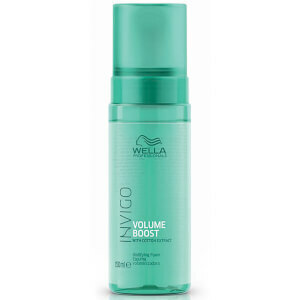 Achieve salon-worthy results from home with Wella Professionals INVIGO Volume Boost Uplifting Care Spray; a weightless formula that works to restore soft, glossy locks from root to tip. Infused with a cocktail of beneficial ingredients, including Cotton Extract, Spring Force Polymers and Volume Boost-Blend™, the leave-in spray delivers lift, volume and definition, without weighing the hair down. Imparts a delicate fragrance of Linden Blossom, Sandalwood and Musk. Aqua/Water/Eau, VP/Methacrylamide/Vinyl Imidazole Copolymer, Alcohol Denat., Polyquaternium-16 , Phenoxyethanol, PEG-40 Hydrogenated Castor Oil, Panthenol, Fragrance/Parfum, Sodium Benzoate, Polyimide-1, Disodium EDTA, Acetyl Glucosamine, Cetrimonium Chloride, Citric Acid, Polysorbate 80, Ethylhexyl Methoxycinnamate, Glycerin, Hexyl Cinnamal, Linalool, Limonene, Citronellol, Gossypium Herbaceum (Cotton) Seed Oil, Decylene Glycol, 1,2-Hexanediol, Tocopherol.